The East African Rift Valley stretches over 3,000km from the Gulf of Aden in the north towards Zimbabwe in the south, splitting the African plate into two unequal parts: the Somali and Nubian plates. 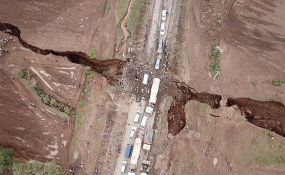 Activity along the eastern branch of the rift valley, running along Ethiopia, Kenya and Tanzania, became evident when the large crack suddenly appeared in southwestern Kenya. This entry was posted on Monday, April 2nd, 2018 at 00:03	and is filed under Uncategorized. You can follow any responses to this entry through the RSS 2.0 feed. Both comments and pings are currently closed.